I quite like natural German brand, Lavera, although I do feel that the packaging is generally in need of an update. Although organic skincare and bodycare is now ubiquitous, makeup options remain fairly limited so I was intrigued to try this Organic Tinted Moisturising Cream. Ok, it's still skincare to an extent (although Lavera do have a makeup line) but incorporates colour for those who require some coverage. In fact, I was surprised at the level of coverage provided. Although it feels lightweight and is by no means as heavy as a foundation, it is heavier than I've come to expect from a tinted moisturiser. I was sent "Natural" shade and for me, the colour was a little dark. Looking on the website, it seems that there are 5 shades offered so not hugely extensive but there is some choice. I'd say that you definitely need to try before you buy as I was surprised at how dark the "natural" shade came out. 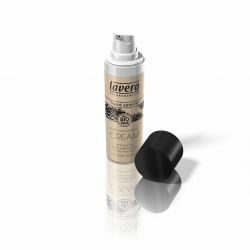 Although I generally think that Lavera packaging needs updating, I didn't mind the presentation of the Tinted Moisturising Cream which reminded me somewhat of Bourjois' Bio Detox Organic Foundation. It doesn't look expensive but it is functional and I liked that the pump dispenser means that there's no wastage. My one complaint would be that I'd prefer a transparent bottle so that I'd know when I was running low. Suitable for all skin types, I found that it felt very wearable. I could definitely tell that I was wearing more than a standard moisturiser but still felt that my skin was able to breathe. Being a cream formula, it gives a modern, dewy finish which I really liked. I'm not hooked- I still prefer my Heaven by Deborah Mitchell Tinted Moisturiser but this is an affordable option worth checking out at £11.90 for 30ml. I haven’t heard of this brand. I like the sound of this, I prefer a little more coverage usually so if this is a little heavier than a tinted moisturiser I think this would be perfect. Where can you buy it? Thanks for your comment. You can buy it online but given the difficulty I had in getting a colour match, I'd recommend trying before you buy. I believe it's sold in some health food stores.